Natures most efficient predators use sharp vision to isolate their prey. Our Trophy series allows you to assert lethal authority from the top of the food chain in just such a way. Their "Amber-Bright" high contrast lens coatings help you discern deer-brown from all the other browns in the woods. Multi-coated optics gather maximum available light when you're on the prowl at dawn and dusk. That big deer may think he's invisible. Our trophy series will make you the last thing he never sees.  Multi-coated optics  1/4 M.O.A. fingertip, audible / resettable windage and elevation adjustment  Amber-Bright  high contrast lens coating  One-piece tube  100% waterproof/fogproof/shockproof construction  Dry-nitrogen filled  Fast-focus eyepiece. 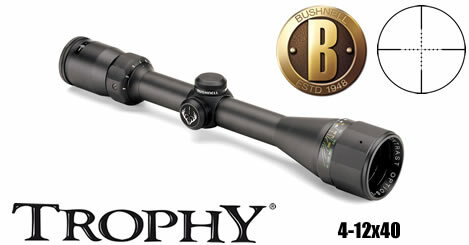 Engineered with Amber-Bright optics that quickly help you distinguish between a brown tree and a brown critter, the Trophy® riflescopes have been heralded by hunters as the ideal scope for the autumn deer woods. With multi-coated optics for increased brightness in low-light conditions, the avid inner hunter in you will be most satisfied. No question about it, they're designed to excel during the day's most important times.  Adjustable objective  Focus from 10 yds. to infinity  Multi-coated optics  Amber-Bright high contrast lens coating  One-piece tube  100% waterproof/fogproof/  shockproof construction  Dry-nitrogen filled  1/4 M.O.A. fingertip, audible / resettable windage and elevation adjustment  Fast-focus eyepiece.